For a lot of people, internet shopping can feel a little bit inhuman. 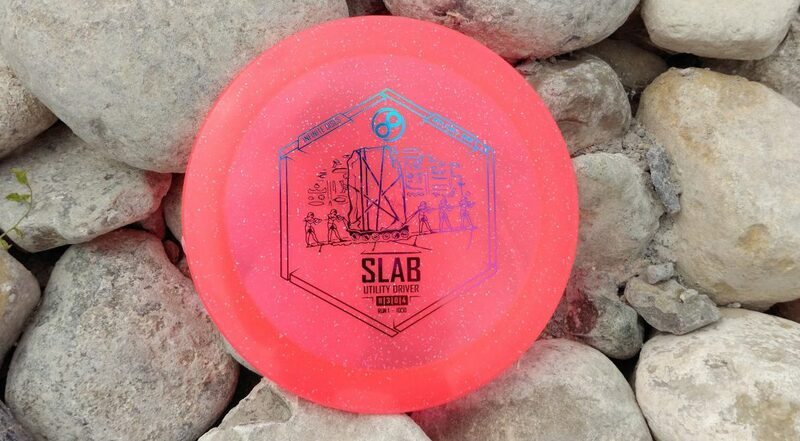 You select photos of discs that look like what you want, checkout without saying a word to anybody, and the discs almost magically appear at your doorstep a few days later. But there is some very hard-working humans that make all of that come together smoothly. We have a dedicated crew that carefully takes photos of all the discs and uploads each one to our website by hand, and then they code and stock those discs so that we can retrieved them with as little error as possible. There are also very dedicated guys who find the discs for each order and package and ship those orders to you. Meet Troy LaMont, a guy who is one of the most dedicated order “pullers” that we have. He can put several miles a day on his feet, walking around our warehouse, gathering the discs for each order so that they are ready to ship. 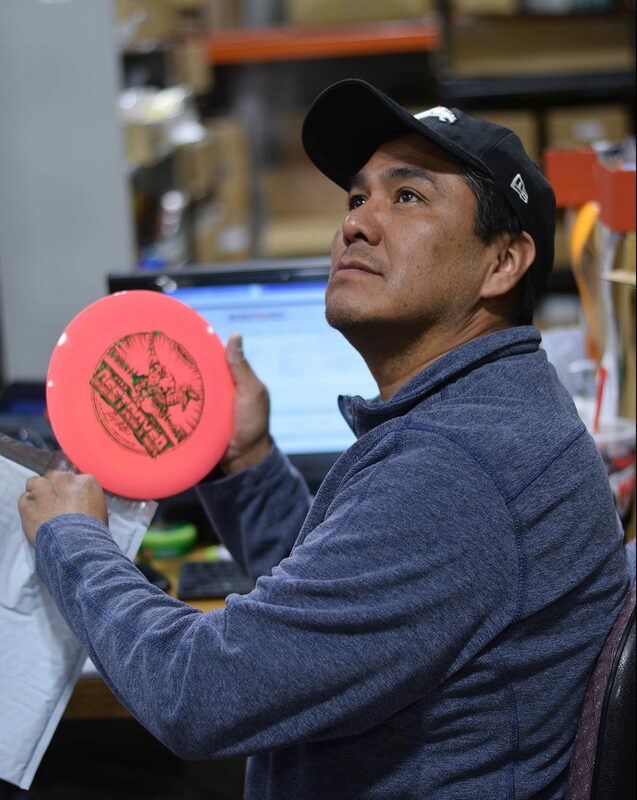 Troy has been working at Infinite Discs for a couple of years now and is a vital part of what we do. Aside from pulling orders, he also helps with adding inventory, keeping track of our apparel selection, and organizing our storefront for the local shoppers. Meet Adrian Toledo, another hard-working man who shows up first to work every day. He manages the warehouse and keeps all of the supplies stocked so that can keep the orders flowing with all of the appropriate packaging, labels, and more. He then sits down for several hours per day to package each order so that they’re ready for the mail pickup in the afternoon. Adrian takes great care to make sure that each order has the discs that the shopper selected. While mistakes are few, considering how many thousands of discs we churn through each week, Adrian does a great job of catching most errors before they leave our building– if there is a weight or stamp color that is a little off, he’ll usually notice. Of course, everybody at Infinite Discs jumps in to help in many ways during the entire process. All of use find ourselves pulling orders and shipping from time to time. When it gets really busy, it isn’t uncommon to find all of our guys running around the warehouse in an attempt to get the orders shipped before the day is over. Thanks for your support of Infinite Discs! It helps to make our jobs a lot of fun every day. From time to time, we’ll keep introducing you to members of our team– the real heroes behind the scenes who make sure you get the discs you want for your game. Infinite Discs has a rewards program where you earn points and then cash them in for gift cards. Then you can use those gift cards to get free stuff from Infinite Discs! If you haven’t already created a login for the Infinite Discs website, then that is your first step. You need to have a profile created in order to earn points. In fact, creating that profile will earn points for you. CREATE YOUR LOGIN HERE. Favorite Discs (In My Bag) – Including at least one of each disc type. 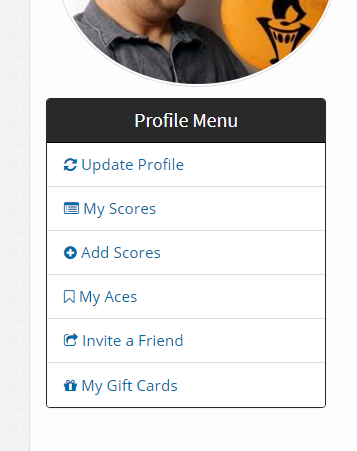 Now that your profile is complete, you can check your profile page at any time after logging in. That is where your point tally and gift cards will be stored. You can reach your profile page by clicking on MY ACCOUNT and then MY PROFILE. Once you are on your profile page, you can see a tally of your points. You can see that there are many ways to earn points. Not only do you earn points through purchases on the Infinite Discs website, but by playing rounds and keeping score on the Infinite Disc Golf App, writing reviews for discs, writing reviews for courses, adding new courses, and many other ways! You can see in the above example that this player has written a lot of disc reviews which have tallied into over 3,000 reward points. 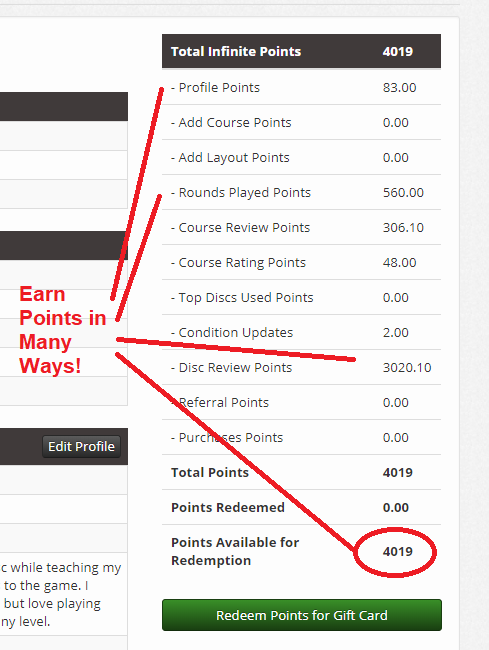 Other points were earned by logging rounds on the Infinite Discs App, and by reviewing courses. If all of the courses around you have already been added to the Infinite Courses database, then you can still write reviews for those courses, or add photos for each hole, if they aren’t there already. There are ways that you can contribute to the quality of the disc store, course database, etc. and earn points while doing it. Once you have at least 1,000 points, you can then REDEEM your points for gift cards that can be used to pay for your purchases through the Infinite Discs store! Simply click the big green button. Once we have reviewed your points redemption request, you will then see your gift card code appear on your profile page by clicking on MY GIFT CARDS. The Gift Card codes can be used during checkout, on the payment screen, by selecting the Gift Card icon as your form of payment. Apply the gift card, and if there is a remaining balance, you can proceed to pay the difference however you’d like. 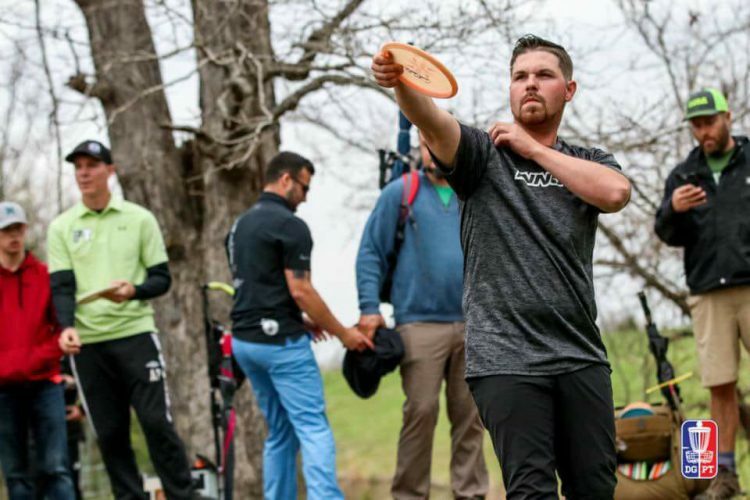 Garrett Gurthie is making his big comeback to the professional disc golf touring season in 2018 and has already made a strong showing in several tournaments. You can follow his tournament results HERE. 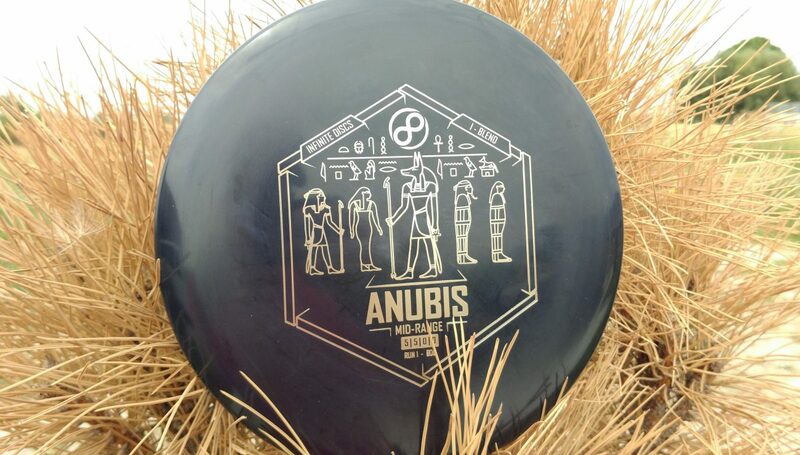 Garrett has already had a signature edition of the Infinite Discs PHAROAH on 100 of the first run discs. As soon as the second run is available, we’ll have a lot more with a cool signature stamp for Garrett! Plus, we’re working with Garrett and Innova to bring back a signature edition of the max weight SONIC which is a classic putt and approach disc that uses minimal effort to glide through tight fairways right into the chains. Check out an example by clicking HERE. 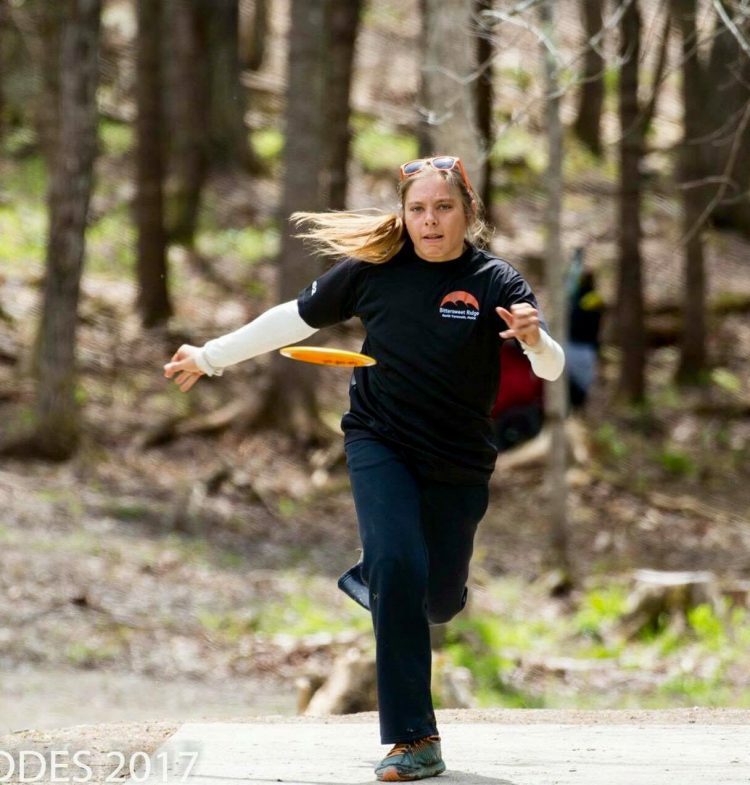 Pickle has been rocking the Women’s Open pro scene for a couple of years now and we’re glad to add her to Team Infinite. You can follow her tournament results HERE. Infinite Discs will be working with Pickle to bring future signature discs to the market that are as fun as she is. Watch for signature discs down the road! We’re also happy to announce that two members of INNOVA’s team are including Infinite Disc models in their bags and will soon have signature discs available! Jessica Weese has kicked off a strong 2018 tournament showing. You can follow her tournament results and history HERE. 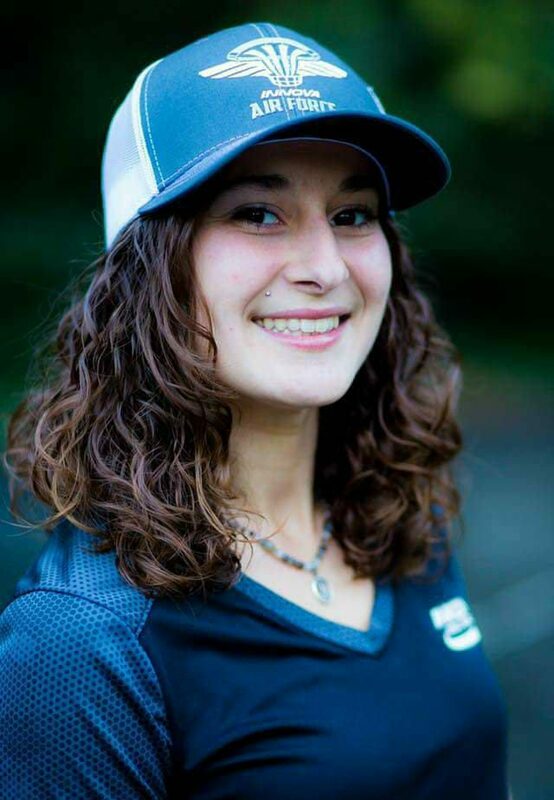 You can already get your hands on Innova’s player support Swirly Star Shryke from Innova to help support her efforts on tour. 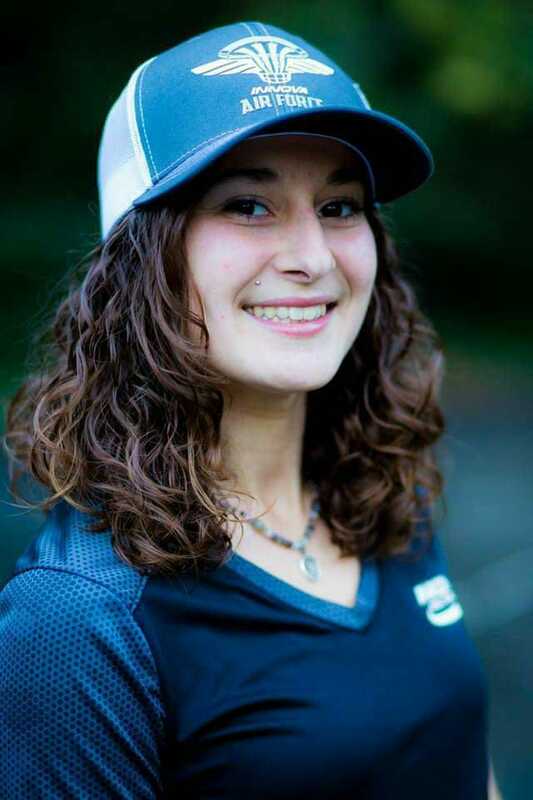 She is a member of Innova’s Star team. 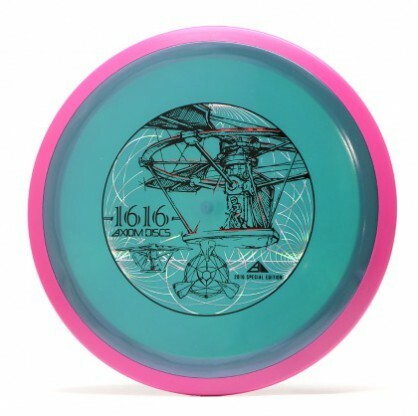 Plus, the Infinite Discs store will soon stock four other popular Innova models which Jessica loves to throw, all with her own signature stamp design, so you can help her out while buying some great discs for your own bag. Watch for Star Destroyers, Star Wraiths, Champion Thunderbirds, and KC Pro Avairs coming soon! Jessica will also have a signature edition of the Infinite Discs CHARIOT once we get to the second run! 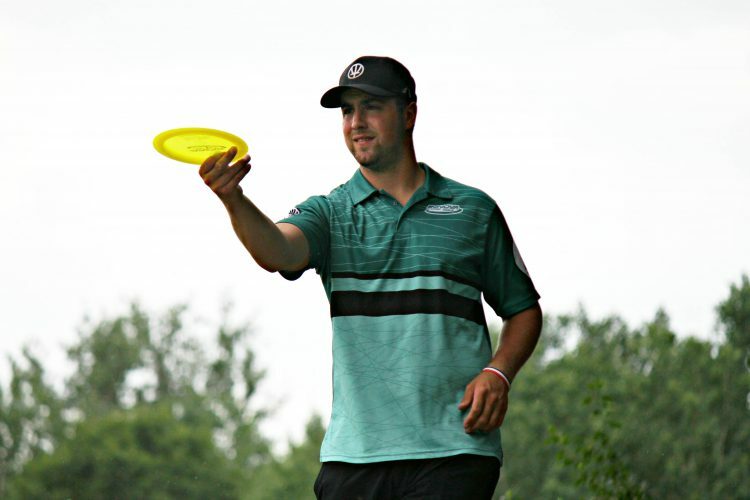 Alex Geisinger has a great touring history as a professional disc golfer. You can follow his history and tournament results HERE. Alex is now putting with the Infinite Discs MYTH and will have his own signature edition as part of the first run in P-Blend plastic! Watch for that to show up this summer and pick it up to support his future touring plans. He is a member of Innova’s Champion team. 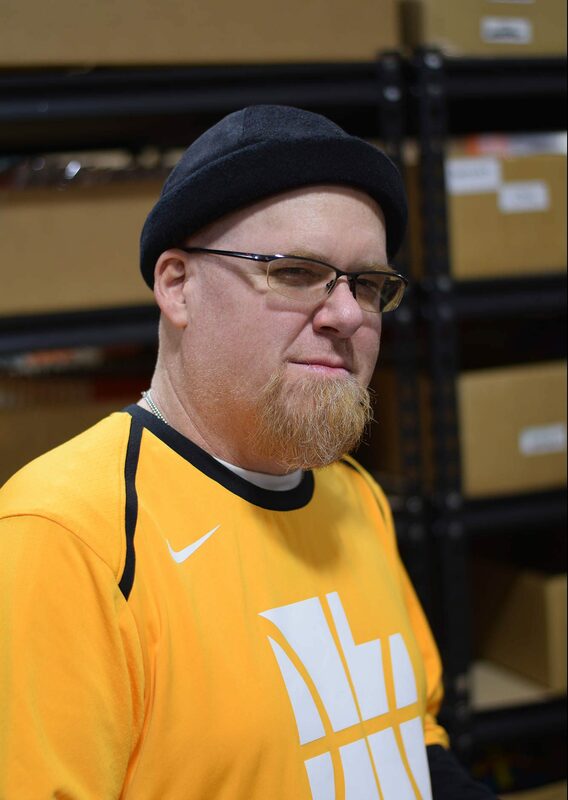 Kesler Martin works full-time at Infinite Discs but likes to get away from the desk job to play tournaments as much as possible. You can follow his tournament results HERE. Kesler continues to run and coordinate Team Infinite and we hope that he continues to rise in the rankings and make great showings in tournaments. 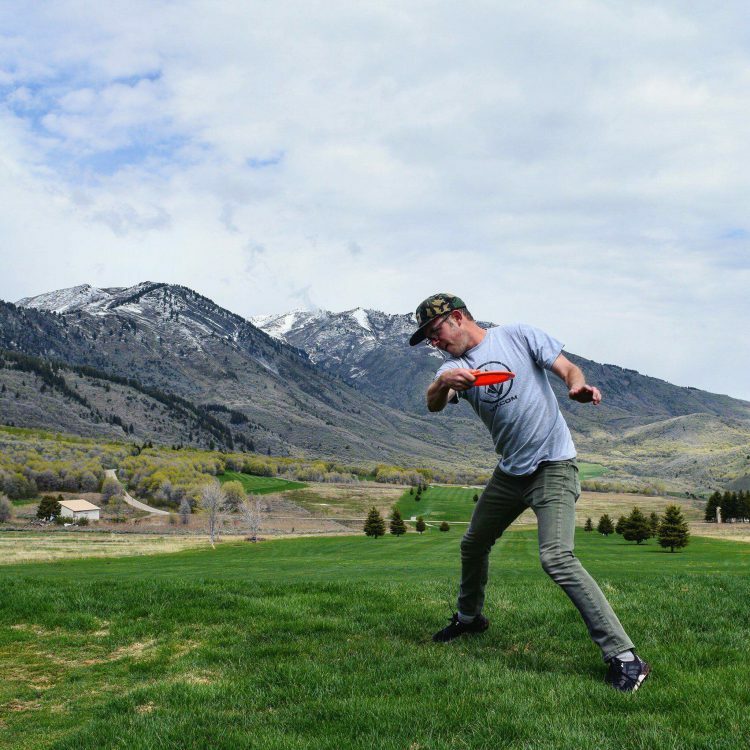 As an artist, we know that he already has a bunch of signature disc designs that he’s ready to unleash on the world, once he unleashes his disc golf fame. But he’s already a champion at work. He is also a member of Innova’s Ambassador team. 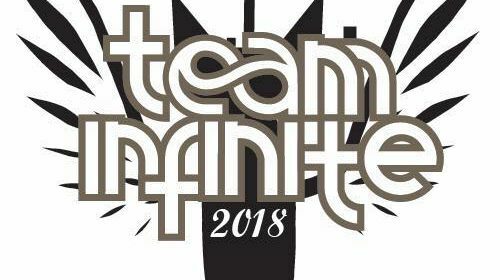 For more information on what’s up with Team Infinite, follow our team blog here. MVP and Axiom fans rejoice! 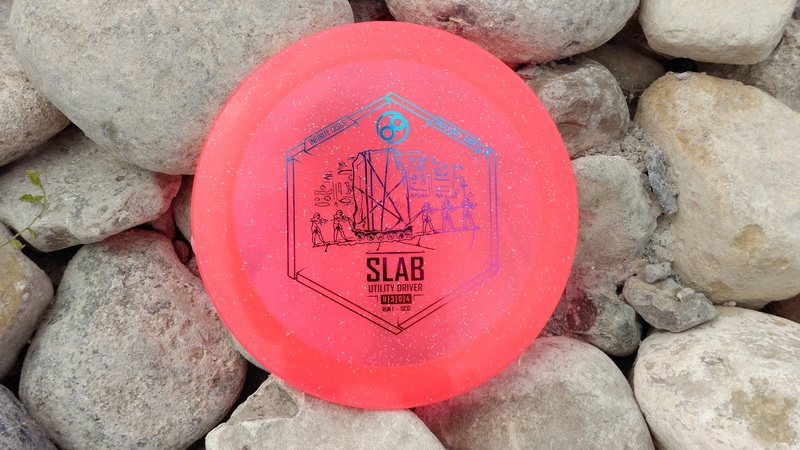 Today MVP and Axiom Disc Sports announced some big upcoming discs to be released on Friday, April 29th. These releases include Plasma editions of the Axiom Theory and the Insanity, along with a new Axiom disc called the Vanish. MVP also announced new Multicolor Tri-Lit LED Lights for night rounds. 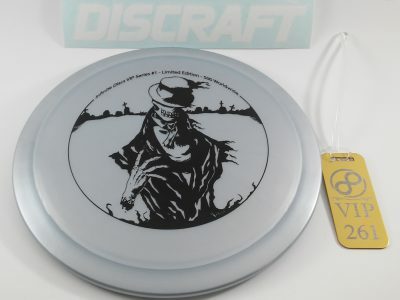 The new editions include the MVP Circuit logo so that you can add a bit of MVP brand to any of your discs for rounds when you don’t want to lose any of your beloved plastic to the darkness. So far the Axiom Plasma editions of the Envy, Proxy, and Crave have seen a lot of support! What other molds are you excited to be released in Plasma plastic? Over the course of the last year we have been quietly working on our own version of bags for disc golfers. Our goal throughout the process was to create a bag that exceeds similarly sized bags in both quality and affordability. We feel that we have accomplished that with both the Infinite Small Bag and the Infinite Large Bag. During the entire month of October, we are offering this bag at an excellent introductory price. Shoulder strap with fabric shoulder pad. We had two options to fix concerns with fabric. Stop using fabric, or use better fabric. To keep the bag affordable, fabric is the answer. To make it more durable we found 1680D Nylon; the most durable nylon fabric available in textile manufacturing. When you touch the fabric you can feel the density of this durable material which is more and made of dense strands of nylon which are more resistant to shredding or tearing. This is the most resilient fabric to adverse conditions. Zippers frequently come off their tracks, or the pull tab completely breaks off of the zipper; requiring you to improvise with a paper clip or just never zip your bag again. To remedy this, we went with YKK zippers. In case you are unfamiliar with zippers, YKK is the most trusted brand of zippers in the world. All metal, and smooth sliding, you should be pleased with your YKK zipper. Having addressed all of these issues, we hope that your Infinite Large Bag or Infinite Small Bag treat you well for years to come. Will your bag have issues eventually? We hope not, but unfortunately everything comes in need of repair; with an Infinite Discs bag, chances are that your time between replacement bags will be drastically reduced. We feel confident that we have created a very quality bag made of durable material. If you experience any issues with the workmanship listed above within the first three months, contact us and we’ll gladly help you. Please view our Return & Exchange Policy.